The TVS series supercharger is a compact 4-lobe high helix rotor design for increased power, original equipment quietness and reliability without adversely affecting fuel economy. 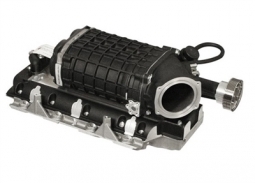 The TVS1900 has proven itself in a number of OEM and aftermarket applications on a wide range of engine sizes. Generating 6 psi of boost, the Magnuson Supercharger delivers power gains of approximately 105 horsepower and 105 lb-ft of torque at the rear wheels, for a total of 416 hp and 444 lb-ft at the wheels!